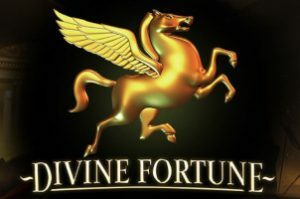 Divine Fortune is a progressive slot with a local jackpot which is individual to each casino you play on. Which means that the jackpots only increase thanks to the bets placed by other players who play on the same casino as you. And, because the jackpots are local, they’re much easier to win. The minor jackpot frequently falls more than once a day. The major, on the other hand, can drop more than once a week. And the Mega is usually won every couple of months… Well depending on how many players wager on this slot, of course! The minimum bet on this slot is only 20p, and despite popular rumours, you don’t have to bet big to win a jackpot. In fact, they’re plenty of players that have pocketed a life-changing win with a bet below £1 a spin! Bonuses & features: Free Spins, Walking wilds, Stacked wilds, Re-Spin, and Progressive Jackpots. Highest-paying symbol: 5 Medusa Symbols awards 500 coins. The main bonus in this slot, besides the jackpot game which we’ve explained below, is the Free Spins Bonus. To trigger it you’ll need a minimum of 3 Free Spins symbols to land on the game interface. To sum up, you’ll play 5 Free rounds when 3 symbols land in view. You’ll trigger 8 Free games with 4 Free Spins symbols. And finally, you’ll get 12 Free rounds with 5 Free Spins symbols. During the bonus, all features (described below) are triggerable with the help of specific symbols. The Wilds Symbol in Divine Fortune video slot is Pegasus. In this game, it’s quite a powerful symbol since it will not only help you make winning combinations. But also whenever it appears on the game interface, it’ll always trigger a Re-Spin as the symbol leave the game interface and move downwards. It’s also worth knowing that if another Wilds falls behind an existing one, you’ll trigger the Wild on Wild feature described in the paytable. Last but not least, the last symbol you’ll need to keep an eye out for is the golden coin. In fact, after collecting 3 or more coins, you’ll trigger the jackpot game. Plus, it’s worth knowing that each coin also has a random coin win attached to them which can reward you between 10 and up to 200x your bet. There’s no doubt that you should give Divine Fortune video slot a spin if the Mega jackpot exceeds £135,000 since it’s likely to fall imminently. Granted that NetEnt has not revealed official statistic to keep it fair for everyone, but it’s just something we’ve noticed as we closely monitor this slot to give you the best insights in our reviews. So visit any casinos mentioned on casinoservice.org/uk to see which one offer the best jackpot on Divine Fortune video slot. Don’t wait! Change your life with a spin!